When parents and prospective students (not to mention college junkies) want to “know” about a college, what they want most is to get a sense of what it’s “really like,” the inside story so to speak. Most college rankings focus only on what can be measured: test scores, class sizes, financial resources, selectivity, grad and retention rates, the salaries graduates can receive. Some non-numerical ratings–the famous Fiske guide, for example–focus less on formal measures and do offer narratives that provide impressionistic glimpses of campus life. Taken together, rankings and good rating guidebooks provide much excellent information. But surely a big part of the “what’s it really like” story has to be not only the graduation requirements but also the actual classes and coursework required for graduation. How many courses are available in your student’s proposed major? Are there interdisciplinary seminars? How about access to mentors and support for undergraduate research, both more likely if small classes are offered. Yes, you can read about courses if you work your way through undergraduate catalogues. In some cases there will be course descriptions. But what you probably won’t find in catalogues are the number of sections and the actual enrollment in each one. What I have found during five years of analyzing public honors programs and colleges is that one cannot come close to understanding the real nature of these programs without poring over the actual class sections–and course descriptions. When the first edition of A Review of Fifty Public University Honors Programs appeared in April 2012, I realized that it was a tentative step in the process of trying to analyze and report on the most important characteristics of honors programs in prominent state universities. What I failed to understand was just how “tentative” that first effort was. The original emphasis was on honors curriculum and completion requirements, and the overriding idea was that the more honors classes a student had to take, the more that student would benefit from what I called “honors contacts” at the time. Honors students would have more contact with professors in smaller honors classes; they would find a ready cohort of serious students like themselves; they would have far more research opportunities, again allowing more contact with professors. 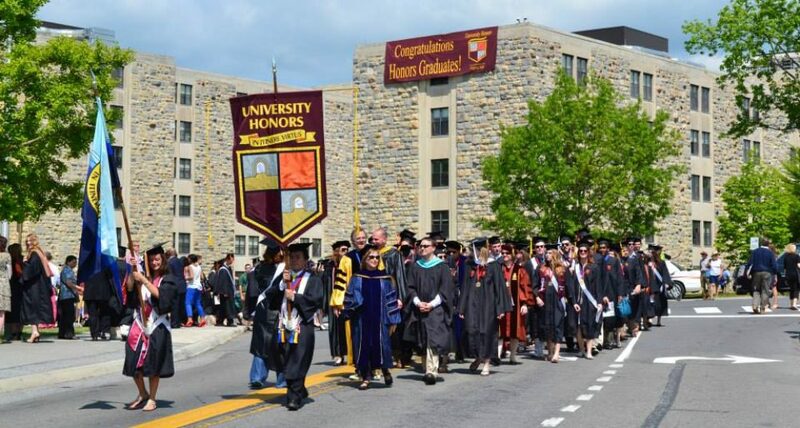 If honors programs sought to provide an Ivy or liberal arts education in the midst of a large public university setting, then the extent of honors contacts within that larger context would measure how well the program was meeting its mission. I continue to believe the curriculum completion requirements are at the heart of an honors program or college. But those requirements only quantify the total number of credits a student must earn to graduate; they do not speak to the range of honors courses offered in each academic discipline, or to how small the classes really are, or to the type of class experiences that are available (seminars, lectures, labs). The credit requirements do not yield an impression of how creative a program is or how interesting its courses may be. In other words, the emphasis on the bare curriculum completion requirements does not get at the heart (some might say guts) of an honors program. Now, with more than 90 percent of our data for the new 2016 edition in house, we have begun to explore the inside of honors education at 60 public universities, which means a somewhat tedious analysis of data for approximately 9,000 honors class sections. How to develop basic classifications for the honors programs and colleges. The courses tell us whether a given program is a “core” program, a “blended program,” or a “department-based” program. A relatively small program with small, honors-only seminars along with relatively few set science and math requirements is a core program. Generally larger programs (some with more than 6,000 students) can be “blended” or “department-based.” If blended, they will have a large number of all-honors seminars, perhaps one-third to one-half of the total honors courses available, and the remainder of courses will be more narrowly defined by the academic departments. Department-based programs might offer a few seminars but offer most honors sections through the academic departments. If a blended or department-based program has a lot of “mixed” class sections (honors students plus non-honors students in the same sections), we can then pass along this information to readers, who may or may not care that many sections are mixed. How to asses the size of class sections. We have actual enrollment levels for the 9,000 class sections we review. This will allow us to tell readers about the overall average class size for all honors sections, including mixed sections which tend to be larger. From this, readers will gain an idea of how much close interaction with “honors contacts” is likely. How many honors classes are “contract” or “add-on” sections. Contract sections require an honors student to sign an agreement with the instructor specifying the extra work the student will do to earn honors credit. Most contract sections have only a very few honors students. The same is generally true of “add-on” sections, but these are somewhat more formal in that they are regularly offered term after term and have more established requirements that honors students have to meet to earn honors credit in a regular section. Readers may or may not like the idea of this type of section. Are they less rigorous? Is the flexibility they allow worth it? Our data indicate that in our data set of 60 programs, these types of classes may be about 25 percent of total honors sections. Please note that about two-thirds of programs offer contract or add-on sections for credit, but only five or six offer them on a large scale. So…to know what “it’s really like really like” in honors program A or honors college B, you have to put yourself in the classroom, so to speak, and get a feel for the characteristics and subject matter of those class sections. Do you want the feel of a small, closely-knit program with a well-defined curriculum and rigorous seminars? Do you want the intimacy of seminars but also the nuts and bolts offered by a broad range of departmental honors classes? Or, are you mainly interested in having as many class choices in as many disciplines as possible, even if some of your classes will be mixed and relatively larger than the all-honors sections. Once we have finished our “classroom work,” we should be able to give you a better sense of what 60 prominent honors programs and colleges are, in fact, like.